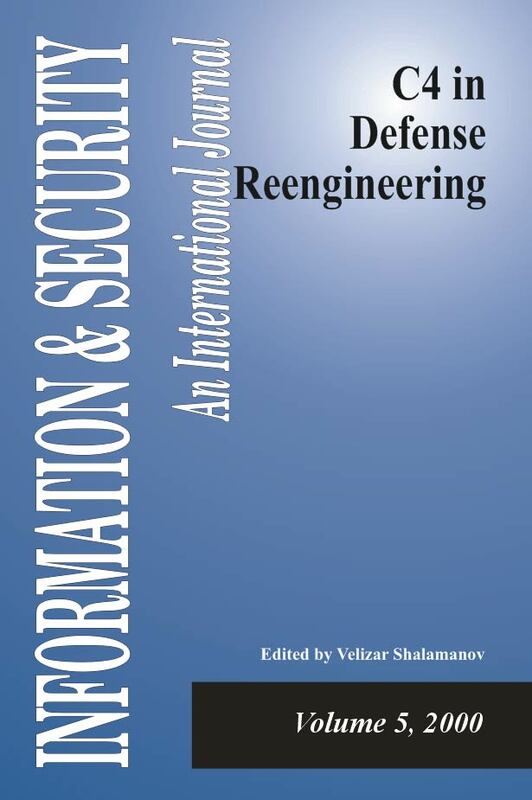 The volume focuses on advances and changes in the use of C4 (Command, Control, Communications, Computers) to redesign, reengineer and improve the way armed forces, government ministries and international coalitions use communications infrastructure and networks to better operate and communicate with each other. The publication focuses in particular on efforts in Bulgaria and South Eastern Europe. The "Monitor" sections includes presentation of the recently created second chapter of AFCEA in Bulgaria - AFCEA-Varna. "Reengineering Defence: the Role of C4." Information & Security: An International Journal 5 (2000): 5-8. Shalamanov, Velizar. "Lessons of Transition in Bulgarian Security and Defense." Information & Security: An International Journal 5 (2000): 9-19. Diedrichsen, Loren. "Command and Control: Operational Requirements and System Implementation." Information & Security: An International Journal 5 (2000): 23-40. Balabanov, Stoyan, and Karmen Alexandrova. "C4I System Reengineering: Essential Component of Bulgarian Armed Forces." Information & Security: An International Journal 5 (2000): 41-59. Myer, Charles. "C4ISR Architectural Frameworks in Coalition Environments." Information & Security: An International Journal 5 (2000): 60-72. Grigorov, Vladimir. "Engagement of the Ministry of Defense and Bulgarian Armed Forces in Establishing Information Society." Information & Security: An International Journal 5 (2000): 75-85. Koburov, Todor. "Information Support for Decision-Making during the Kosovo Crisis." Information & Security: An International Journal 5 (2000): 86-93. Starkey, Kate, and Andri van Mens. "Defence Budget Transparency on the Internet." Information & Security: An International Journal 5 (2000): 94-114. Mollov, Petar. "Participation in the Consortium of Defense Academies and Security Studies Institutes and Advanced Information Technologies." Information & Security: An International Journal 5 (2000): 115-124. Monitor, ISIJ. "The Information Revolution and Post-Modern Warfare." Information & Security: An International Journal 5 (2000): 127-128. Monitor, ISIJ. "New AFCEA Chapter in South-East Europe." Information & Security: An International Journal 5 (2000): 129-130. Monitor, ISIJ. "Information Assurance Challenges." Information & Security: An International Journal 5 (2000): 131-132.